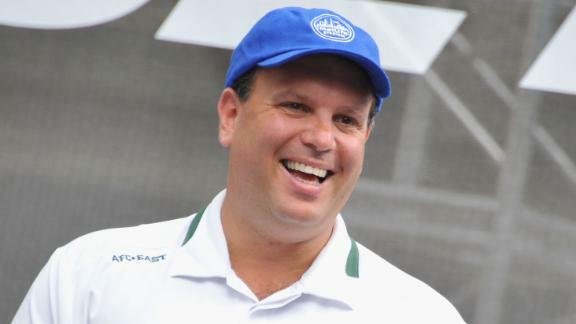 Former New York Jets general manager Mike Tannenbaum has joined the Miami Dolphins as the team's executive vice president of football operations. Tannenbaum will start his new job on Feb. 1, and both he and coach Joe Philbin will report directly to team ownership. The 45-year-old has worked with the Dolphins as a consultant since August following 16 years with the Jets, the final seven of which were in a general manager capacity. Tannenbaum has a track record of being well-versed in salary-cap and contract-negotiation matters. "I am excited that Mike Tannenbaum has joined the organization full time," Dolphins owner Stephen Ross said in a statement. "He is an experienced executive and leader that understands all facets of the sports landscape. During his time as a consultant this past season, I was able to see his impact first hand through his commitment and passion for innovation and using every possible avenue to find competitive edges." The Dolphins hired Dennis Hickey to be their general manager last offseason. His notable moves included drafting offensive tackle Ja'Wuan James in the first round out of Tennessee and signing offensive tackle Branden Albert in free agency. The Dolphins finished 8-8 this past season, third in the AFC East. Tannenbaum is currently serving as an agent and, among other clients, represents Seattle Seahawks defensive coordinator Dan Quinn, who has had several interviews for teams regarding their head-coaching vacancies. Tannenbaum is expected to continue to represent Quinn through a potential contract negotiation if he is offered a head-coaching job. Information from ESPN.com's Miami Dolphins reporter James Walker contributed to this report. Field Yates discusses why former Jets general manager Mike Tannenbaum will be a good fit in the Miami Dolphins' front office.